Add together peanut butter, icing sugar, treacle sugar and 2 remaining tablespoons of butter, melted. Mix thoroughly. 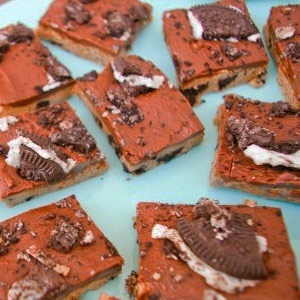 Crush Oreos and put half into the peanut butter mixture. Using a spatula, spread melted chocolate on top of peanut butter mixture. Before the chocolate cools, gently press Oreos into the chocolate. Place in fridge to cool; cut after 20 minutes. Let it chill in the fridge for another 30 minutes to an hour. Recipe reprinted with permission of Milk & Cookies. To see more recipes, please click here.